Photo courtesy of Lelania Little. 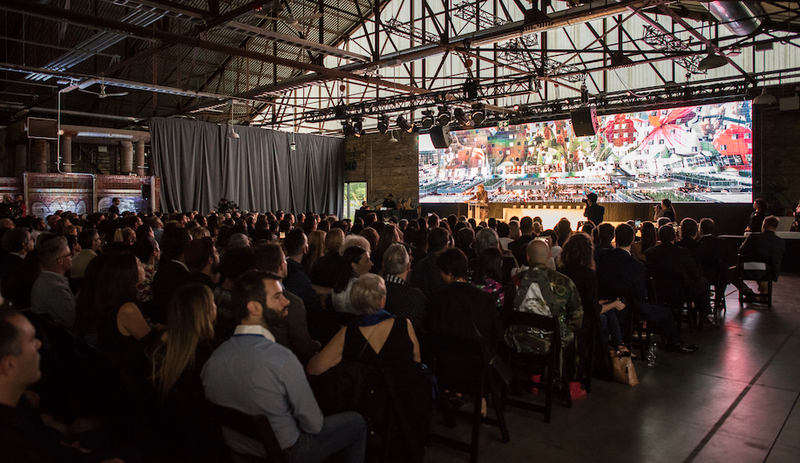 The winners and finalists of the 2017 AZ Awards were the star of the show at the gala, held on June 23 at Toronto’s Evergreen Brick Works, but the installations, winners’ hardware and some serious swag gave guests plenty of additional material to ooh and ahh over. Azure is extremely proud to have collaborated with the following creative partners. 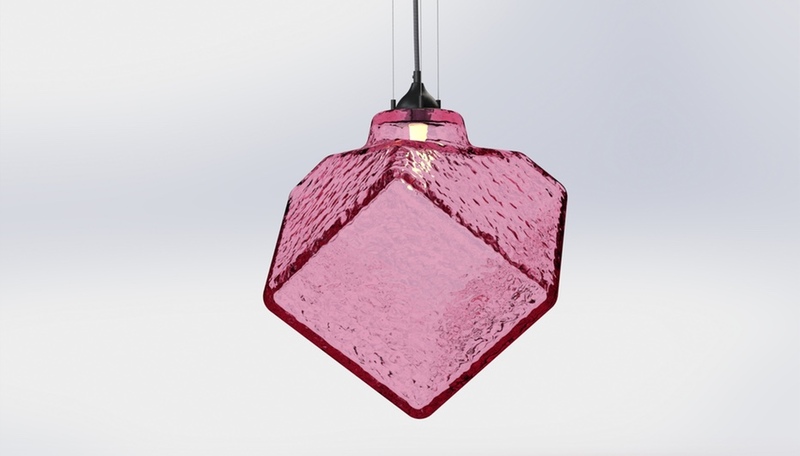 Quebec-born, London-based product designer Philippe Malouin was tapped to envision this year’s trophy, following in the footsteps of designers Omer Arbel and Karim Rashid. 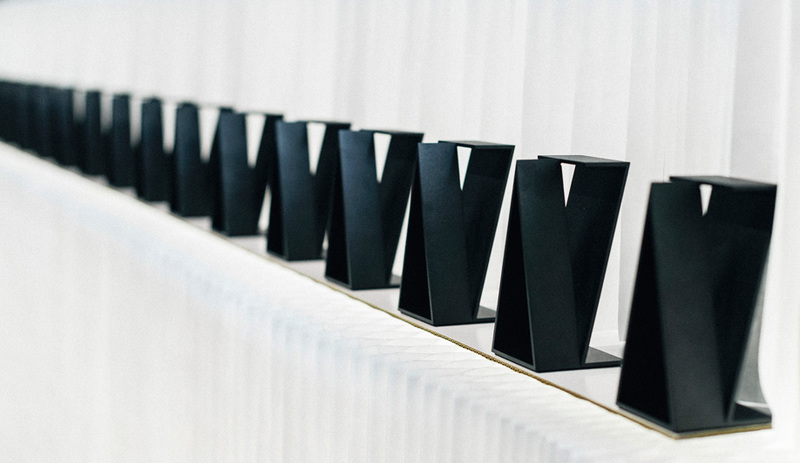 His intention was to create an “objet d’art”; bringing his refined style to the task, Malouin created an award featuring an ‘A’ backed by a ‘Z,’ both razor-thin, in matte black steel. The trophies were originally intended to be 3-D printed in steel, however the technology is still in development and the results are sometimes unpredictable, so a search was launched for an alternate production method. 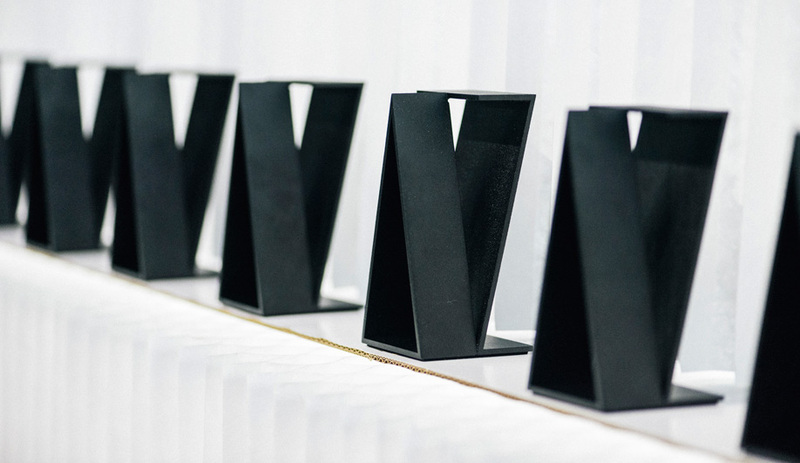 Matt Carr, Umbra’s VP of Design, came on board and arranged for the local production of the 20 trophies that are now in the proud hands of the winners. Photo courtesy of Mauricio Calero. 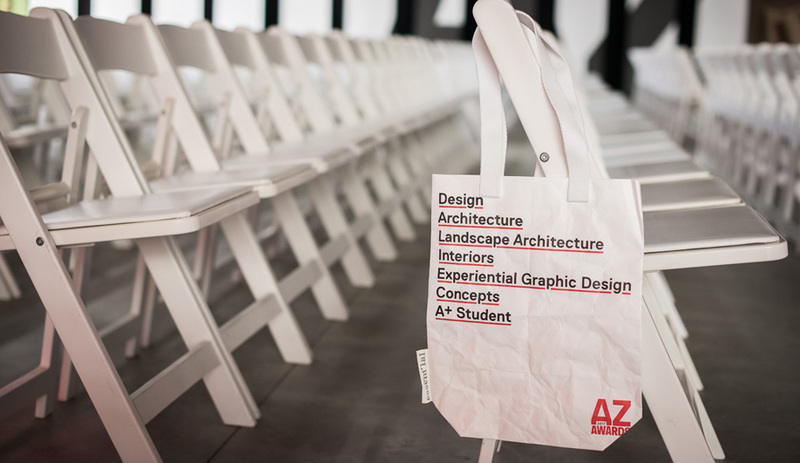 A new branding concept was developed for the 2017 AZ Awards, created by local multidisciplinary design studio Frontier. 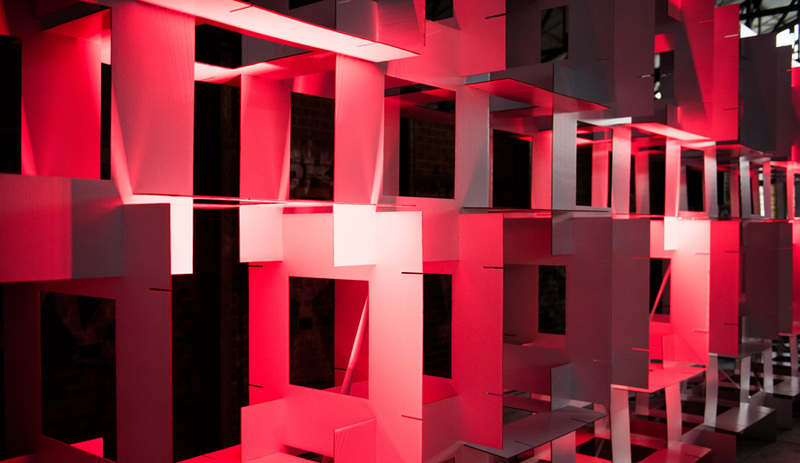 The concept, which features an expanding and contracting framing device that allows the various disciplines of the AZ Awards program to be featured, also served as inspiration for an installation at the gala. 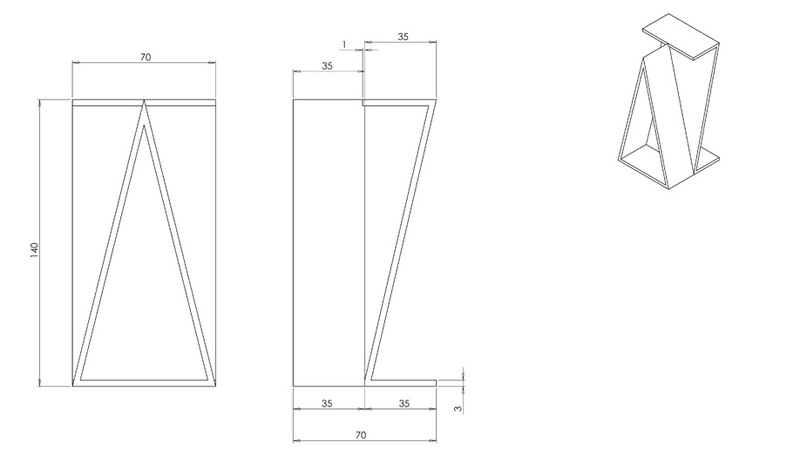 Frontier worked with a traditional box manufacturer to produce and die-cut hundreds of interlocking cardboard sheets. 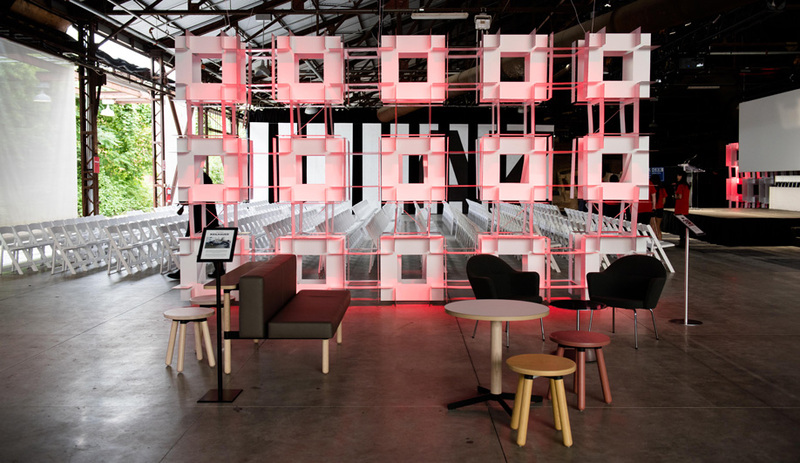 After some pre-gala experimentation, Frontier and gala volunteers used a construction-toy-like method to assemble the tower of paper volumes behind the stage and smaller interventions scattered throughout the space. Photo courtesy of Elena Zaralieva. 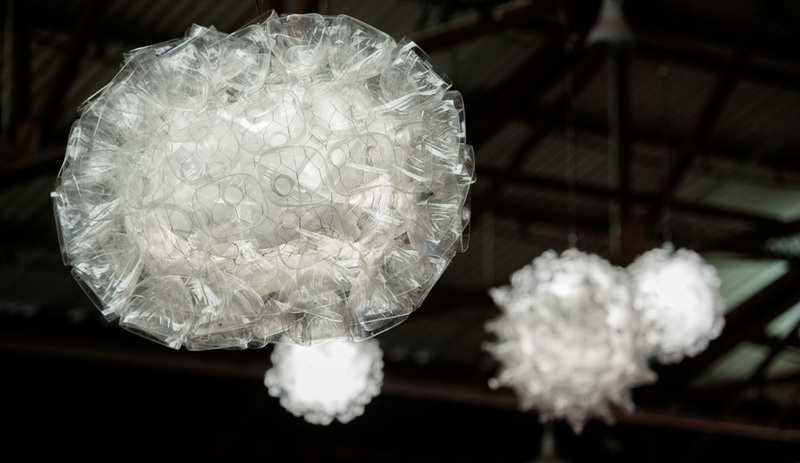 Toronto architect Eric Charron reworks recycled plastic bottles into striking light fixtures, furniture and artworks. Since 2012, he has successfully diverted 1500 plastic bottles from landfill. After discovering his works at local art exhibition, Azure asked Charron to create custom chandeliers for the 2017 gala. 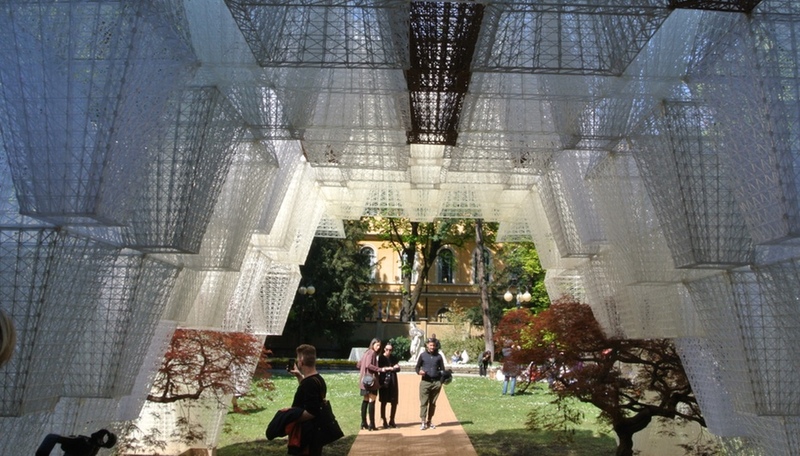 He came back with seven sculptural fixtures – four that measured nearly a metre in diameter and three smaller iterations – made from bottles, wire armature and reused packing foam, and lit with LED bulbs. 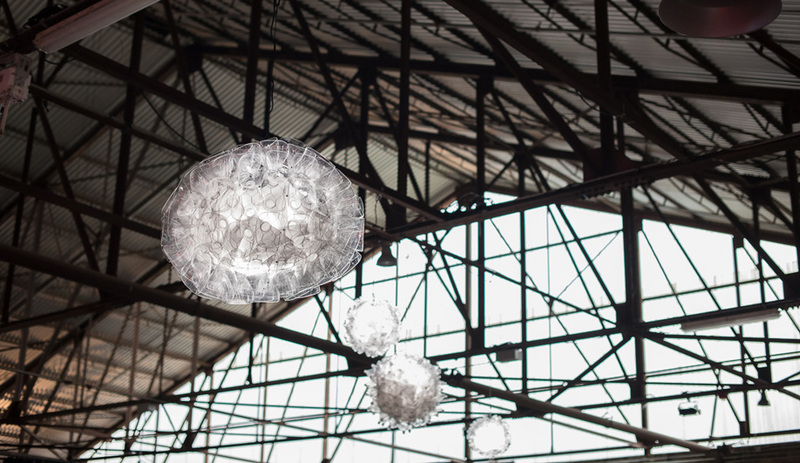 The lights were suspended over party-goers in the Brick Works’ CRH Gallery. 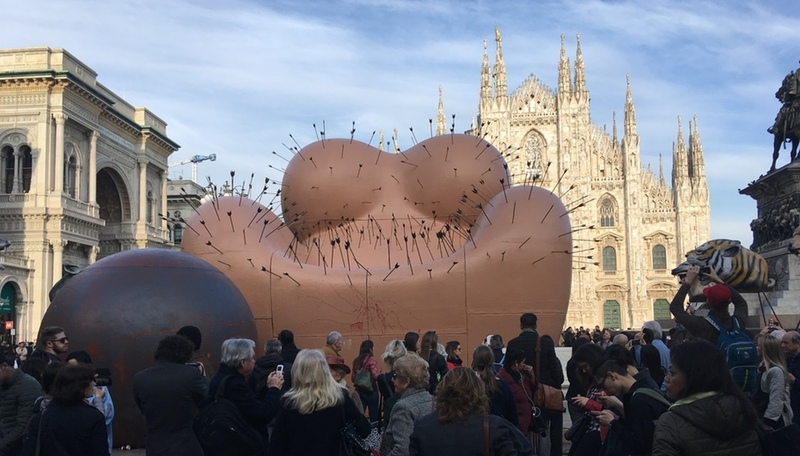 Back in April, during the Salone del Mobile in Milan, Azure partnered with Italian company Essent’ial for The Essential Taste of Design, an exhibition organized by Matteo Ragni. Impressed by their exceptional products and dedication to quality, Azure jumped at the opportunity to have the company imagine special bags for the gala. 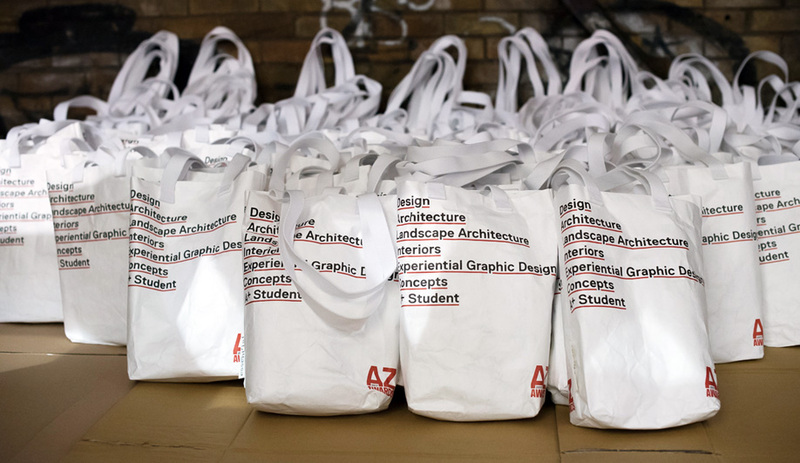 Essent’ial used Tyvek to create the loot bags, which were branded with the AZ Awards categories and logo, and filled with goodies, including umbrellas from Rado, water bottles from DXV, portable chargers courtesy of Cosentino and more.